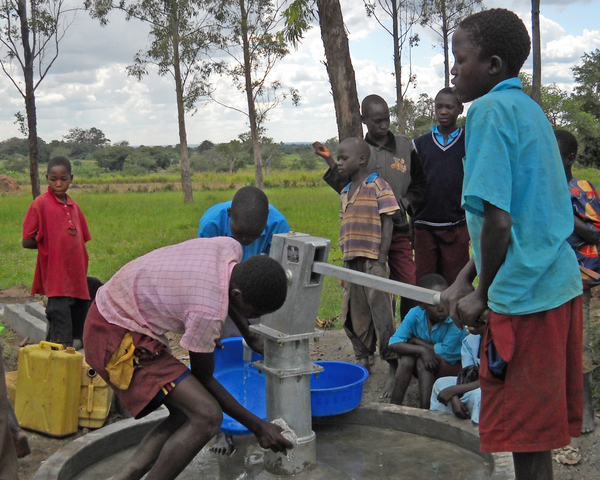 A deep well at Te-Ongora Primary School in northern Uganda will bring safe water to over 1,000 students and staff. Trainings on management of the water source, promotion of gender equality and safe water, sanitation, and hygiene practices. After obtaining quotes from three local drilling companies, Lifewater's local partner contracted the drilling of the deep borehole and hand pump installation at Te-Ongora Primary School. This drilling is part of Lifewater's ongoing three-year program in northern Uganda providing safe water, adequate sanitation, and effective hygiene in schools and communities. The project includes 10 deep wells, 102 shallow wells, and 80 hand pump repairs. Te-Ongora is one of 31 schools in the program and one teacher from the school was trained in Lifewater's WASH in Schools curriculum. The school has now formed a functioning health club in which students learn and teach their peers the basic building blocks to better health. As project manager, one of my goals during my trip to northern Uganda was to visit the schools and see how the hand pumps are holding up. I was thrilled to find the new hand pump, drilled in July 2011, nicely fenced and the area very clean. I was accompanied by several staff of the implementing partner, Divine Waters Uganda, and was met at the school by the headteacher, the Water Committee Chairman, and hundreds of students who were at the school during their holidays to retrieve their report cards. We were told that the students heard we'd be coming, so waited for hours for our arrival. As soon as we stepped out of the car we were the singing and shouting sea of light blue school uniforms engulfed us ushered us over to the seats they had put under the shade tree for us. Having expected the students to be on break, we weren't prepared to give any speeches, but made some impromptu encouragements to the students to stay in school and to always drink safe water and practice good hygiene and sanitation. Afterwards we walked over to the hand pump, tested it out, and got a chance to talk with the head teacher and Water Committee Chairman for a bit. The headteacher told us about the difficulty of the common mindset in the rural villages that fails to value education, especially for girls.The Chairman spoke of the drastic differences he sees now that the students and community members are drinking safe water. "We were getting Cholera very much but now days we are being back from it, because of the clean water." He said that the water looks the just as fresh in the pot at home as it does straight from the well instead of turning dark or smelling bad like the water from the pond they used to use. The school is trained in water source management and helped to form a Water Source and Sanitation Committee comprising of students, teachers, and parents. The inclusiveness of the committee fosters a sense of ownership of the water source by all stakeholders and increases their commitment to protecting and maintaining the well. In total, 819 people attended the training and determined a monthly amount to be contributed per student and per family which will be deposited into a bank account the school has opened to save up for future maintenance of the well. Having already been trained in Lifewater's primary school WASH curriculum, the students and teachers were well aware of the consequences of the contaminated water they were using. They were very eager to get access to safe water, and thus very willing to do whatever is necessary to ensure the water stays safe. This project has reinforced Lifewater's method of supplementing all water interventions with hygiene and sanitation trainings. Although the school student population is 1,110, Lifewater caps the number of students benefiting from access to a school borehole 1,000. Access is defined as approximately 3 L/day of water for drinking and hand washing, according to Sphere standards. 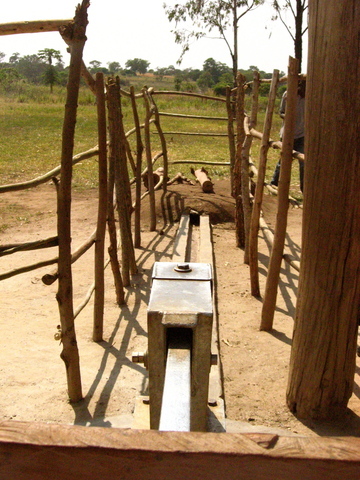 Boreholes with hand pumps have 16.6 L/m average flow rate. If sustained for an average of 3 working hours per day, the number of school beneficiaries per water point with hand pump should not exceed 1000 people. Supplementary trainings benefit the entire student population of 1,110. These trainings include support setting up a Water Source and Sanitation Committee to protect and maintain the water source. Trainings also cover important water, sanitation, and hygiene practices such as hand washing at critical times, use of latrines, and keeping water safe. Lifewater has partnered with Divine Waters Uganda for 10 years and has trained the staff of the organization in Sanitation, Hygiene, Biosand Filtration, Hand Pump Repair, and Well Drilling. 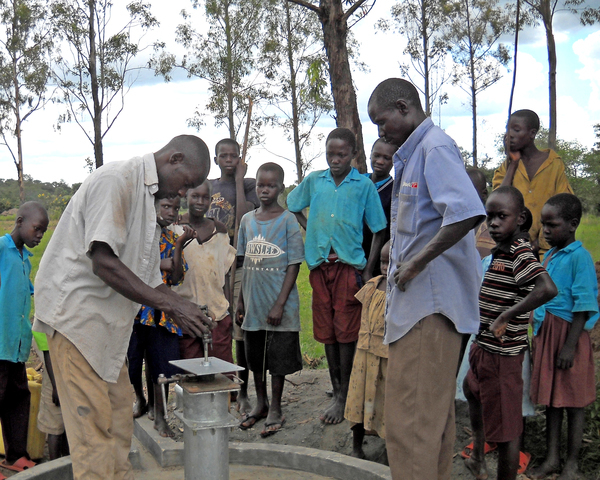 Divine Waters Uganda is the implementing partner based in Lira and has served rural communities in northern Ugandan since 2001; they started work in Abako Sub-county in 2009.